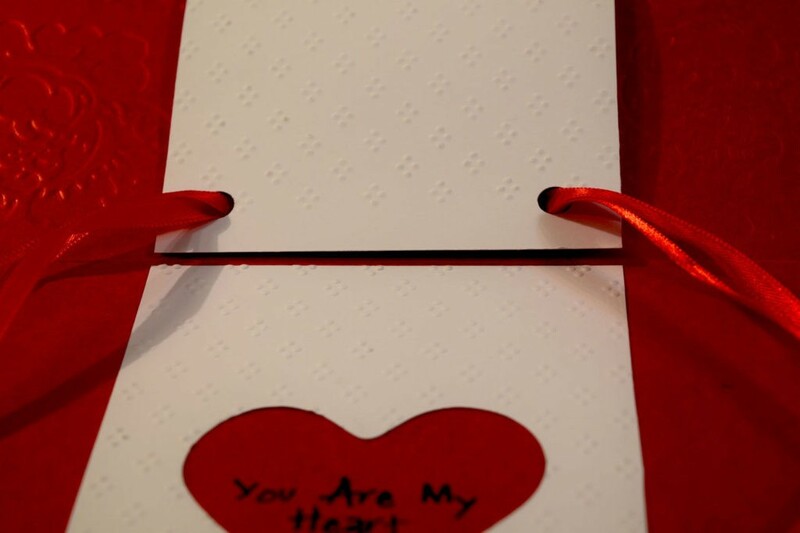 Everyone loves the joy it is to receive a Valentine on Valentine’s Day from someone that cares about you. Well this Valentine’s Day give this Valentine’s Day Paper Card to someone that you care about with the special treats that they love so much. Celebrate this holiday with us by giving the gift of joy to someone that you care about. Everyone remembers candy hearts. This year they are hard to find but at Michaels had some small boxes. If you can’t find them use any other medium size candy that won’t fall out the back. 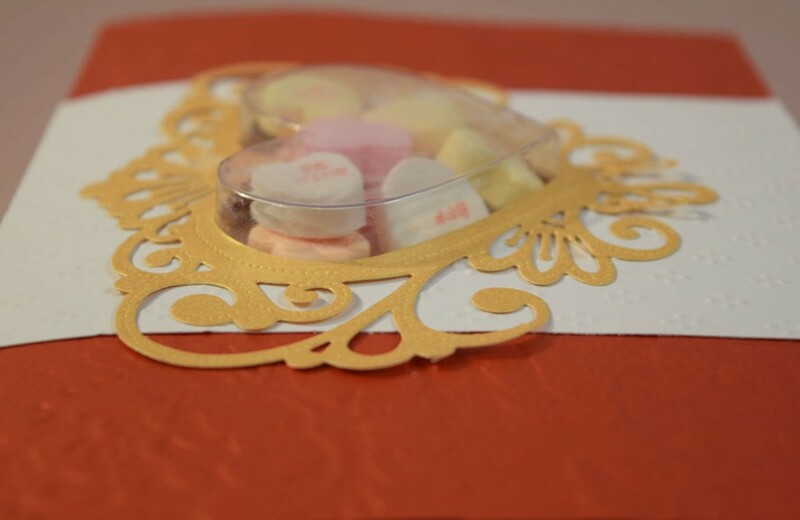 The Creative Expression, Treat Cups, Heart, is 2.5″ in diameter and a tad under .5″ deep. They don’t hold a lot of candy, but buy two little boxes so you can pick through them for the good ones. Most of the YouTube videos do not include how to get into them, so this card opens in the back and closes with a ribbons. If you use smaller candy, tape the sides and close the opening with text paper, taped on all sides, with a tab at the bottom to rip it up. The 3rd easy choice is to use a second cup and cut the top off it so it nests in the bubble of the first cup; they are tightly nested in the packaging. Close the back with a circle that has ribbon tied through 2 holes for a pull so it becomes a lid for the first cup. 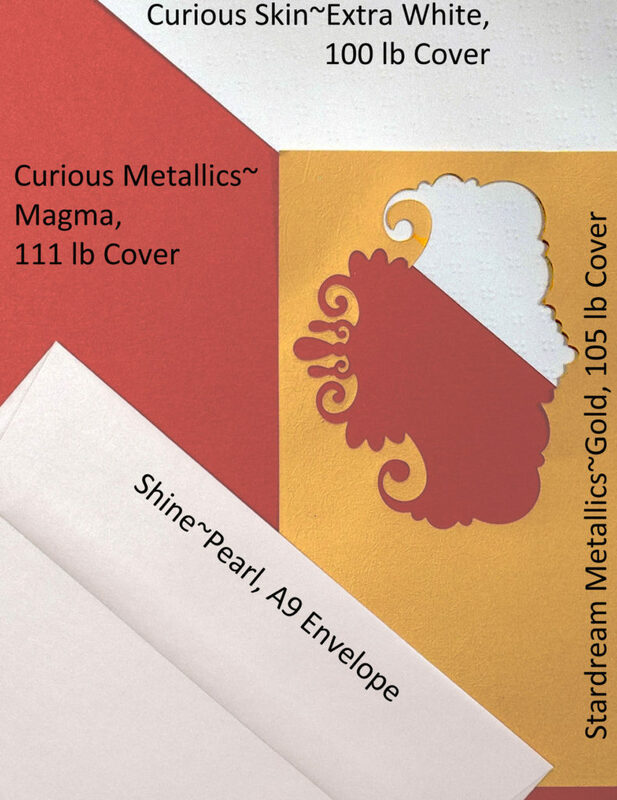 Since the card has depth, use Pearl, A9 envelope and turn it into a small box, 1″ deep. Keep referring to the photos. Score the 2 sides and bottom .5″ up and work the crease in both directions. 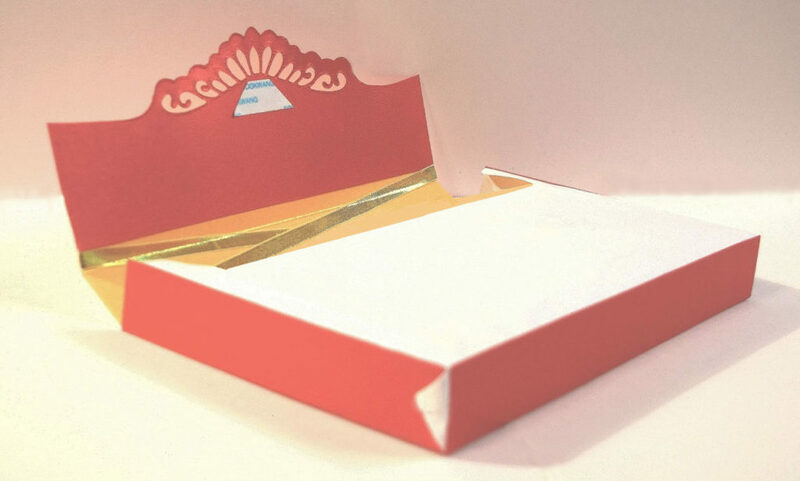 Work the envelope into a box like you would open a grocery bag, turning up the little triangles on the bottom. To reinforce the sides and bottom, cut strips of paper from Magma and using 1″ ScorTape, add the strips to the sides and bottom, referring to the photos. Add a little ScorTape and glue the triangles down, holding them in place a few minutes until they dry. Trim the envelope flap flush on the sides, score and fold it 1″ from its original flap. The envelope box is now approximately 1″ deep, 5.25″ tall, and 7.75″ wide, not counting the Magma stripes. Cut a piece of Gold to 4.5-inch x 7.75-inch and score it at 3.25-inch; using 1/2″ ScorTape at the top and right under the fold, slip it inside the envelope as a liner. This will add a little body to the envelope. Cutting the Magma to 3-inch x 7.75-inch, die cut the edge with Creative Expressions Triple Gemini-Celpheus; don’t forget to add the edge line to it, leaving about 1/4-inch edging. Using the smooth die and a pencil make a pleasing curve to the edge and trim it with Tim Hotlz scissors. 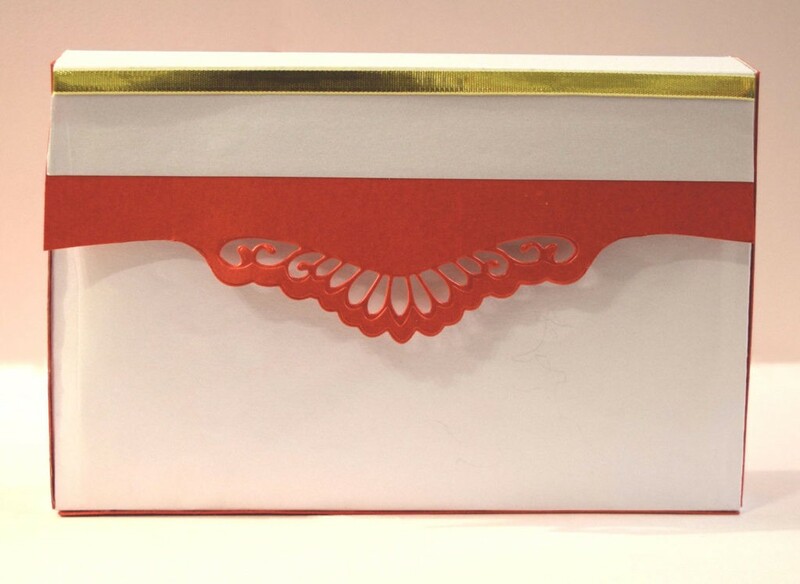 Cut 2-inch of 1/4-inch gold ribbon and apply 1/4-inch ( or 1/8-inch) ScorTape to the back and wrap it around the envelope flap, doubling back in a crisscross pattern; trim the edges to an angle before finishing the application. Trim any Magma off the flap as needed and apply a small piece of ScorTape, leaving the backing on, so you can use it to close the flap. You are done with the envelope. The final card is 5-inch x 7.5-inch and made from the Magma. It is best to die cut any paper before you emboss it as running it through the Big Shot again will flatten the embossing. Sadly I know this to be true; you can realign the embossing plate and run it again, if need be. Trim a 8.5″x11″ sheet of the Magma to 7.5-inch wide and score it at 5-inch, then fold and trim the bottom. Using the Creative Expressions, Fillables-Jewelled Heart die, use the plain little heart inside the filigree die. Center it on the front of the Magma and emboss just the front with Teresa Collins, Cabbage Rose, A4 embossing plate, or whatever suits. 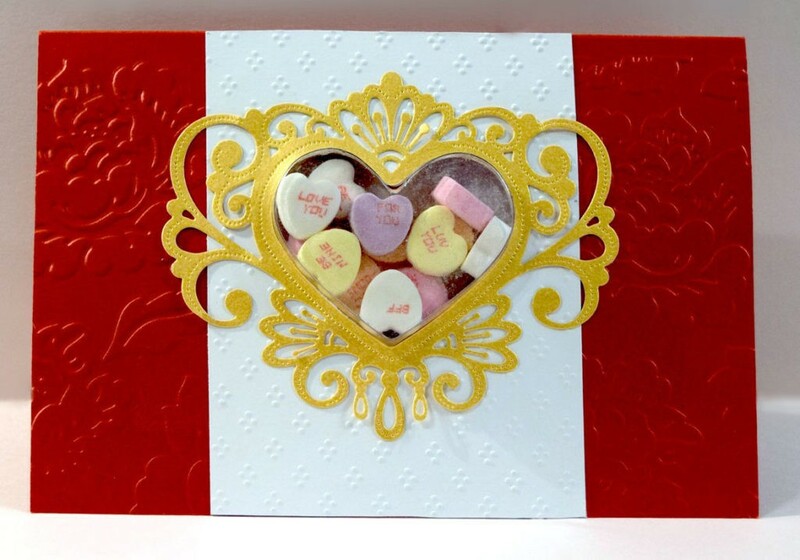 This card does big background pattern with a small pattern for the overlay inExtra White which is embossed with Spellbinders, M-Bossabilities, Dainty Dots. 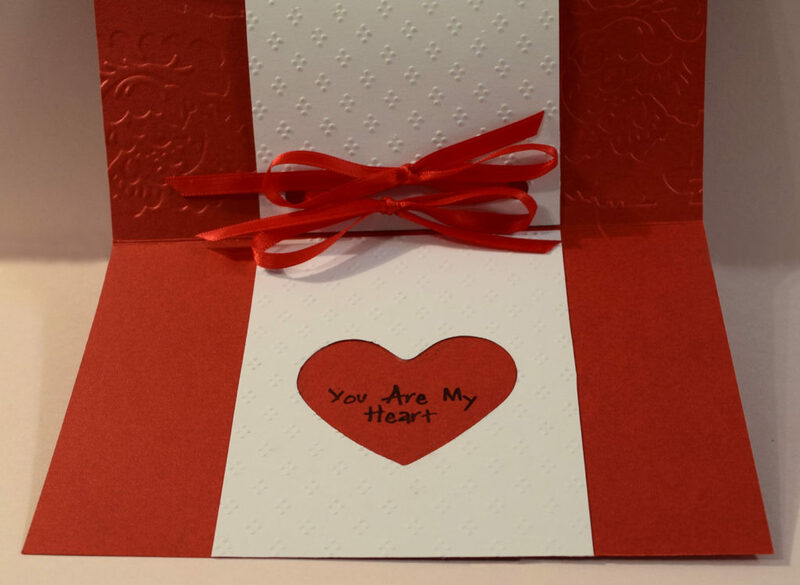 It too was cut with the smaller heart outline and then embossed. The Extra White started out about 5.5-inch tall x 5-inch wide and was cut to size after die cutting and embossing. I won’t lie, centering it was hard, so I left extra paper for adjusting it. To be exact the heart is centered side to side , but set higher, 1.75″ from the bottom, measuring from the bottom of the heart. Do what suits. Apply the Extra White to the Magma with ScorTape. Keeping putting in the Fillable Cup to be sure everything is lined up. Cut the Fillable-Jewelled Heart filigree from Gold. Try it on and see how it looks, but save it until last so it doesn’t get messed up. Apply 1/8-inch ScorTape around the edges of the plastic punch cup being sure to get the tape on the top and not the back so it sticks to the Magma, from the back. Add some Cosmic Shimmer Acrylic Glue over the tape and hold it until it dries a bit. You might have to turn it in the hole and adjust it a bit, for levelness; the cups are almost perfectly made, but everything is a tad off, it seemed, so just wiggle things a bit until they look right. 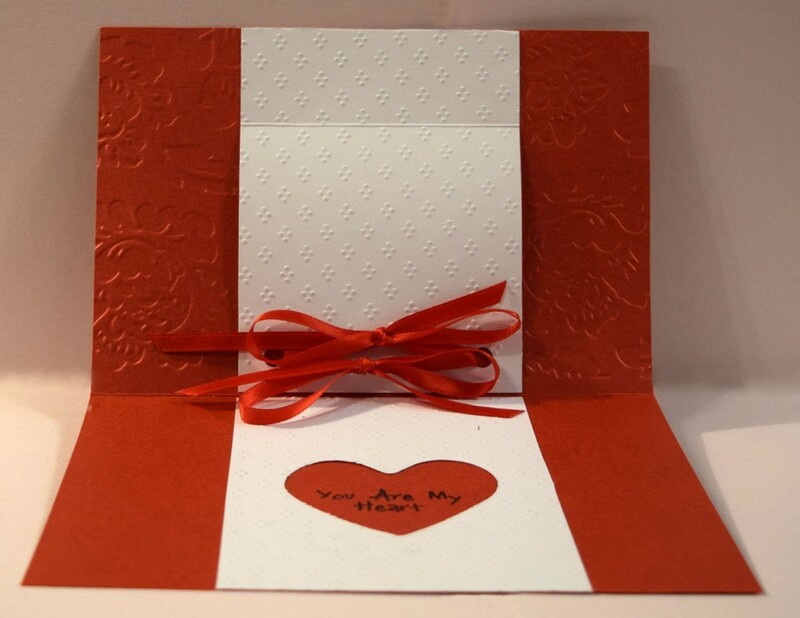 On the inside of the card do another Extra White piece the size of the front piece and score it about 1 3/8-inch down, or right above the bottom of the heart on the back, which is upside down when you open the card. To cover the plastic heart base, cut a heart shape from Sizzix’s heart dies and glued it down over the plastic. It is not a perfect fit, but it looks better. Unfortunately the Fillable Cups only fit into the matching dies. I taped down the top of the Extra White and if you are giving it away, you will need to tape the sides a little. Using a 2 hole punch add holes for the ribbon. Refer to the photos. Using 1/2-inch ScorTape, add some tape between the holes where the ribbons will get taped on the bottom; marking the holes with a pencil. I used 2 small red ribbons since I had them. Use bigger ribbon if you like. You have to pull the ribbon tight when you tie it. Cut a 3rd piece of Extra White and die cut a heart in it. Emboss it. Using a pencil to mark the heart, before you tape down the Extra White, stamp your sentiment. Use any stamp that fits inside the heart. Notice the back of the card is flat so stamping is easy; only the front was embossed. Now ScorTape on the Extra White with the heart cut out. 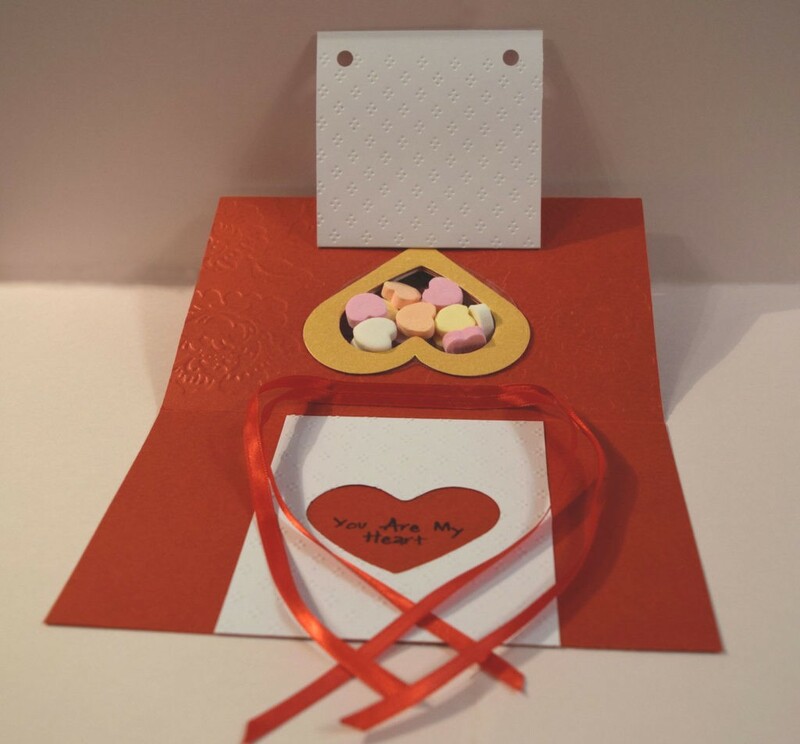 Fill the heart bubble with candy, lightly tape and tie down the back and you are done. If you are handing the card and envelope off in person, it makes a lovely present. If you are mailing it, use a babble wrap mailer. It is fun to make and fun to give. Feel free to substitute. Once you have the treat cups, you can use an exacto to cut the shape and use tiny flowers around the opening. There are many ways to do this card and all will look good.